A Southern Grace: how easy is that? Well, it was really easy, Ina, but frankly, it just didn't taste all that great! If you had asked me last week, I would've said that 560 people probably can't be wrong. My tune has changed, though, because I tried a recipe currently approved by 560 people, and I didn't like it. I didn't like it at all. The resulting chicken and sauce were WAY too bitter, and each bite was more unpleasant than the next. My boyfriend didn't love it either, but he tolerated it much better than I.
I've been cooking for a while now, and I've watched more cooking shows than I care to admit. To the best of my knowledge, lemon and lime juice are always added off the heat, right before serving. Further, the pith of those fruits is extremely bitter and surely contributes some sourness when it's baked in a dish. 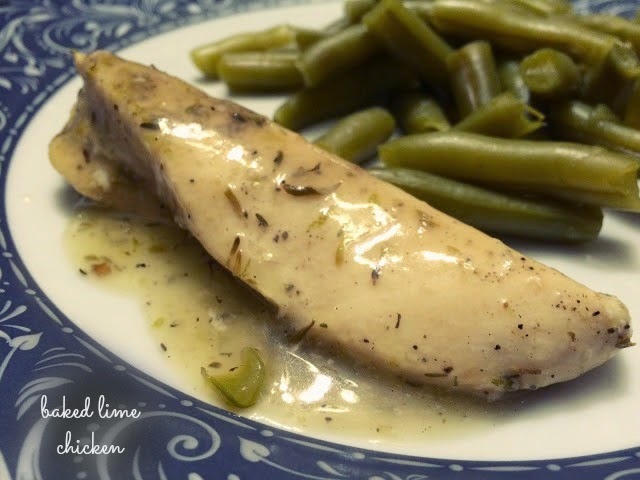 Both of those no-nos (or what I've always believed were no-nos) were included in Ina's popular recipe for baked lemon chicken breasts. I did diverge from reliable Ina's recipe, I will admit. I used replaced the wine with chicken broth, used skinless breasts, and substituted lime juice and zest for lemon. My thyme was also dried rather than fresh. Okay, so now that they're listed, I see that I made a lot of changes, but with these things in mind, please tell me--what am I missing? Was one of these tweaks a terrible error on my part? Or do my taste buds differ drastically from those of pretty much everyone in the world? My guess is that it's a little bit of both, but I'm curious to see what you folks might suggest. Warm the olive oil in a small saucepan over medium-low heat, add the garlic, and cook for just 1 minute but don't allow the garlic to turn brown. Off the heat, add the chicken broth, lime zest, lime juice, oregano, thyme, and 1 teaspoon salt and pour into a 9x12-inch baking dish. Pat the chicken breasts dry and place them skin side up over the sauce. 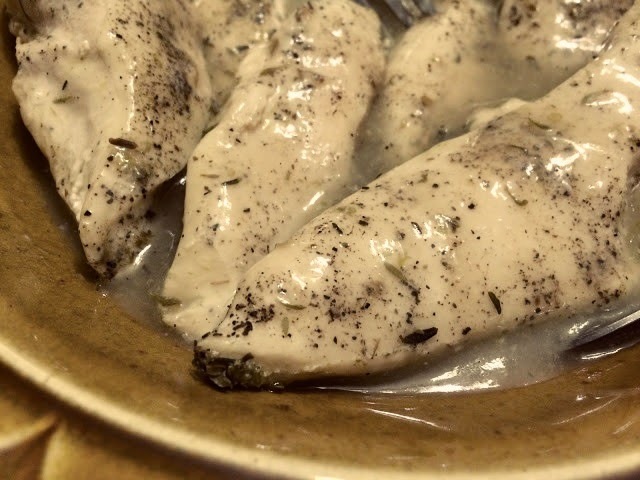 Brush the chicken breasts with olive oil and sprinkle them liberally with salt and pepper. Cut the lime in 8 wedges and tuck it among the pieces of chicken. Bake for 30 to 40 minutes, depending on the size of the chicken breasts, until the chicken is done. Cover the pan tightly with aluminum foil and allow to rest for 10 minutes. Remove the chicken from the dish and thicken the sauce with cornstarch, if desired, or sprinkle the breasts with salt and serve hot with the pan juices. I have had good experiences adding lemon and lime juice before cooking. I find that if I am cooking something for longer than 10 minutes with citrus slices, then the pith makes the whole dish bitter. Sorry it didn't turn out for you! I think the proportion of lime juice to the remainder of the liquid may be too high - it's like 40%. And maybe the zest turned bitter, as Pam suggested. I hate it when something you anticipate turns out so poorly. simply damn delicious tangy and citrusy chicken!!! I would have thought subbing broth for wine would have made the sauce more mellow - can't imagine how bad it would have been with wine as well! I think citrus juice can go in early, but I have had similar problems subbing sliced limes for lemons: lemons soften and mellow as they cook, limes get really bitter. It looks good and I wouldn't think your swaps would've made a difference. It just sounds like too much citrus to me. I hate it when that happens and it just did last week with a pork roast. You never know, who will like what. :-) Have a good weekend. Maybe she called for skin on breasts because some of the fat rendered from that would have thickened and maybe mellowed the sauce some? Shame it wasn't your style, citrus can become overkill sometimes! Citrus and chicken sound like a great combination to me. Sorry to hear that you didn't enjoy it at all.. Could it be too much lime juice? Dried lime is more concentrated than fresh. Its bitterness is more pronounced, too. All that being said, though, sometimes recipes just don't meet our expectations no matter what we do. Interesting post and comments. I didn't know that it wasn't easy to substitute lime for lemon. I wonder if that made the difference - I usually find Ina's recipes completely reliable. Now I'm tempted to try the original! I actually think the thyme could be the culprit here. Since thyme is in the mint family it usually "marries" well with both lemon and lime. However, it has been my experience that for some reason when it is overly dry, it enhances the bitterness in both. I do agree the citrus ratio does seem a bit high but the bitterness is most likely from the thyme. I always get bummed when I make a recipe with the best reviews and I just don't fall in love with it. I'd love to hear if you fix this recipe because I love that citrus taste. That's too bad. I just had a disappointment with Pork Scallopini. Do you use a microplane to zest? That was my best discovery ever--how to get almost no white in with the zest using it.